CAN's CCDI Toolkit provides a wealth of information to encourage and facilitate diversity and inclusion. CAN has kept equity, diversity, and inclusion at the forefront of its work and developed a toolkit to provide resources to organizations and individuals to encourage diversity and inclusion. 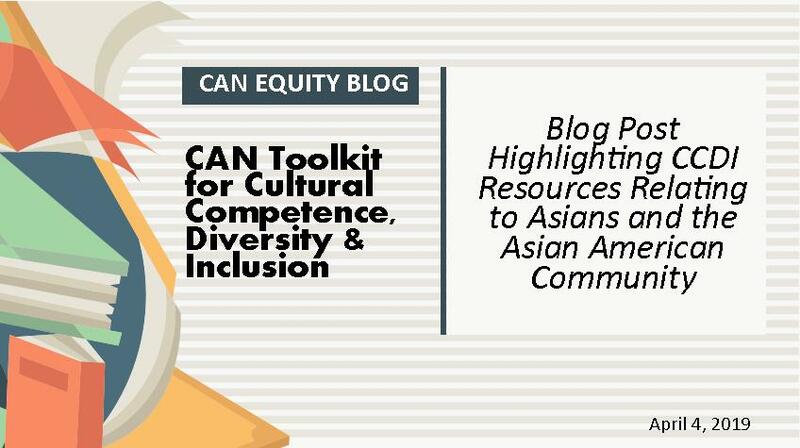 CAN created the Cultural Competency, Diversity, and Inclusion (CCDI) Toolkit in 2014 as a place for organizations and individuals to access resources that promote diversity, inclusion and the practice of cultural competency. The toolkit was updated in 2017 to include more up to date resources as well as an updated framework. The current CCDI Toolkit includes sections that discuss the benefits of diversity and inclusion, the framework of the CCDI, guides and assessments, resources for organizations, resources for individuals, resources for specific populations, and training opportunities. Asian and Asian American refer to a wide range of cultures and nationalities, spanning more than twenty countries across East and Southeast Asia, Pacific Islands, and the Indian Subcontinent. In 2017, over 20 million Asian Americans traced their roots to this expansive geographic region. The CCDI Toolkit includes a fact sheet that breaks down sociodemographic and economic information for the multiplicity of identities that fall under the umbrella term “Asian American.” It also includes a database about health issues and barriers for Asian Americans, culture cues, a cultural competency manual, an Islam diversity guide, multicultural history, a guide to working with Asian American families. Along with resources to help people and organizations understand Asian American culture and how to best serve Asian American community members, it provides resources to Asian Americans to help them plug in to their community. The CCDI includes links to the Asian American Resource Center, which seeks to provide services, resources, and programming through an Asian and Pacific Islander perspective, and the Asian American Cultural Center, which provides spaces and facilities for the sharing of the Eastern and Western cultures that shape the Asian American experience. There are similar resources available listed for each of the races included in the CCDI. The toolkit is designed for individuals and organizations that provide services within the community. Individual service providers looking to increase their knowledge and understanding and enrich their practice, as well as organizations looking to become more diverse, inclusive, and culturally competent. However, anyone looking to learn more about cultural competency, diversity, and inclusion may find this resource helpful. To learn more about the CCDI click the link below http://canatx.org/ccdi-toolkit/.